CSAV International 2005. 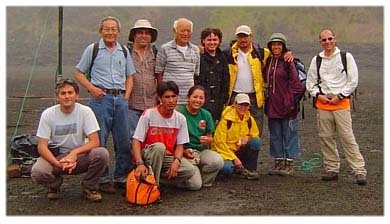 Standing, L-R: George Kojima, instructor; Benancio; Bob Koyanagi, instructor; Fabio; Juan Carlos; Letizia; Giuseppe. Seated, L-R: Jose; Edu; Patricia; Milena. Edu Taipe and Letizia Spampinato adjust the seismic antenna in Kilauea Iki. The group collects gas samples near Halemaumau. David Whilldin demonstrates the installation of broadband seismometer on Mauna Loa. The group hiked out with Scott Rowland and found active lava breakouts in late June.